In other words, UR, the Communists, and LDPR will all gain several seats while Just [barely] Russia earns representation for the first time. Unsurprisingly, this will be reported as a huge landslide victor for UR, despite the fact that it didn’t really improve upon its previous results. Lastly, UR will continue to hold a constitutional majority, allowing it to pass Federal Constitutional Laws and amend the Constitution if it so chooses. For what it’s worth, Boris Gryzlov, the head of UR, announced that, despite its majority, UR will not amend the Constitution. 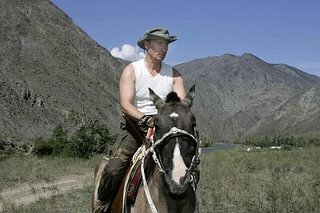 Thus, a change to allow for a third Putin term or for a strengthened Putin Prime Ministership is not as certain as some have alleged. At the same time, the constitutional majority could turn out to be the ‘Sword of Damocles’ over Putin’s successor’s head, preventing him or her from having free reign for at least the first term. Of course, this all depends upon UR being unconditionally loyal to Putin, which is debatable. UR is a party of power, and will likely continue to be loyal to whoever occupies the Kremlin. So what will Putin do? Prime Minister? He must be nominated by and would be subordinate to the President. Chairman of the Federation Council? He would have to be elected to this position from one of the Russian territories, and it’s still largely a figurehead position. CEO of Gazprom? Meh. This entry was posted in duma, elections, Putin. Bookmark the permalink.